In 2012, China overtook the United States as the country with the largest volume of international trade. The value of this trade is over 3.87 trillion dollars per year. This map help serves as a visual aid for this staggering figure. China is the largest trading partner for all countries and territories in red. 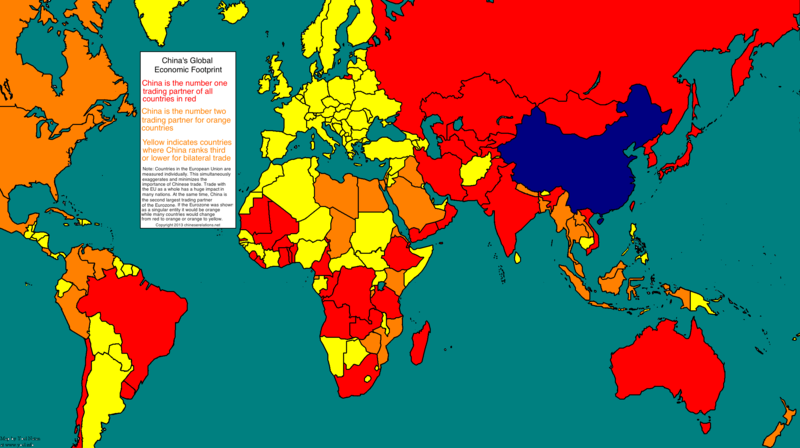 Countries for which China is the second largest trading partner are orange. Data is from the IMF and CIA World Factbook via Wikipedia. Note that EU countries are measured individually. For the purposes of this map, Taiwan’s economy is shown as separate from that of Mainland China.